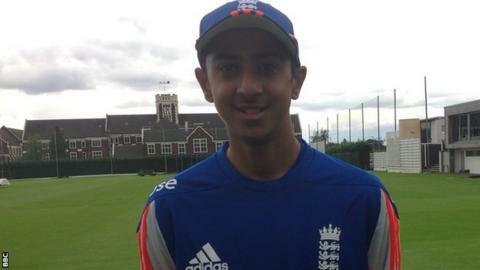 Lancashire's England U19 captain Haseeb Hameed has been getting tips from senior skipper Alastair Cook before the youth Ashes Test against Australia. It is the first four-day match between the teams in England at 19 level since 1999, when Ian Bell, Michael Clarke and Mitchell Johnson all featured. A five-match one-day series follows the game, which starts on Tuesday. "He was brilliant. The thing that struck me the most was how simple he kept it," Hameed told Asian Network. "The way he spoke about his batting almost made me feel as if batting at that level is no different to what it is now - the basics are still the same, the principles are very much similar. "The way he spoke just gave off the right impression and you could tell why he is the England captain." Hameed has been with Lancashire since the age of nine and continued his A Levels despite signing professional terms midway through his studying. He has opened for the Red Rose second XI a number of times this summer, scoring a century two weeks ago at Durham. "I am not sure how close I am to that first-team opportunity - I feel as if I am ready," he added. "I don't look into it too much, or look too far ahead. I know if I keep continuing to score runs then hopefully chances will keep coming my way." Haseeb Hameed was to speaking to BBC Asian Network's Ankur Desai.